Energy drinks. They may give you wings but at what cost? Some people believe them to be straight rat poison while others think they are the nectar of the gods. If only it was that black and white. Kamal Patel, the Director of Examine.com explains that energy drinks are a tad more complicated than we would like: “Part of the reason there are so many misconceptions is that the umbrella category “energy drinks” is more heterogeneous than almost any other category. Sometimes it’s just caffeine plus some kooky ingredients that don’t do anything, sometimes it’s high levels of active ingredients, and sometimes they overlap with ergogenic aids targeted at athletes.” Rather than breaking down every single ingredient in energy drinks, we will go over the most common. Taurine is a naturally occurring amino acid that most healthy individuals produce. Most energy drinks contain around 1,000 mg of taurine, which may help with mental and physical performance, but there isn’t a ton of evidence on it yet. One study published in Amino Acids by Dr. M. Zhang suggested that regular use of taurine helps reduce and alleviate visual fatigue commonly associated with visual display screens. Guarana is a plant found in the Amazon but we don’t ingest the plant, we use the seeds in energy drinks. According to Erica Bud and Karla Shelnutt, PhD, RD, at the University of Florida, say the chemical components of guarana are extremely close to that of caffeine. There also seems to be no major effect on your mood, anxiety, or physiological well-being. B Vitamins are found in almost every energy drink. Normally B3, B6, B12, and B5. According to the National Institutes of Health, having a deficiency in some B vitamins can lead to feelings of fatigue, but more B vitamins doesn’t mean “extra energy”. Honestly most the B vitamins you get from your energy drink go in and out of body in not time. Consuming too much B6 can be dangerous says the NIH, but you’d have to drink nearly 50 energy drinks to reach that level. 1. Consider sticking with energy drinks that have a nutrition facts label, so you can see what you’re ingesting. As Ruth Litchfield, associate professor at Iowa State University, explains, energy drink companies can market their products as dietary supplements and bypass the FDA approval process with a “supplement facts label” that gives you much less information. 2. Look for one with a modest amount of caffeine; somewhere around 100mg, which is about the same as a cup of coffee. 3. Keep your eye on each energy drink’s sugar content. Red Bull, for example, is popular, but also very high in sugar content if you don’t reach for the sugar-free. 4. 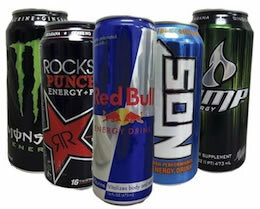 Be sure to check out the actual servings listed on an energy drink’s can. A standard serving size for most energy drinks is eight fluid ounces, but many energy drinks like Monster and Rockstar come in 16 or 24 fluid ounce cans, so keep that in mind as you consider your options.